Women’s breaststroke swimmer Rachel Bernhardt was named “Athlete of the Week” for the week of February 24 – March 1 following her results from the Colonial Athletic Association Swimming Championships. As a 20-year-old junior at Drexel University, Bernhardt won the gold medal and was named Drexel’s first women swimmer to win a gold medal at the CAA Championships. Beginning her collegiate athletic career as a 1:04 breaststroke swimmer, Bernhardt has dropped four seconds and now swims, on average, a 1:00. During the championships, Bernhardt swam a 100-meter breaststroke at 1:00.65 and a 200-meter at 2:10.89. Bernhardt made two school records with both of these times, while also being seated as the 38th fastest female breaststroke swimmer in the nation. Bernhardt will travel to Atlanta, Georgia March 16 to compete in the National Collegiate Athletic Association Women’s 2016 Swimming Championships. Originally from Vineland, New Jersey, Bernhardt grew up partaking in summer swimming camps ever since she was a little girl. It wasn’t until seventh or eighth grade when Bernhardt decided to quit dance and focus more on swimming all year round. With one sister four years older, Bernhardt already had a feel for the college decision-making process before it was time to research her options. After learning about the co-op process, Bernhardt believed she could get the most out of her education and athletics by attending Drexel. As a health science major, Bernhardt will begin her co-op adventure at Jefferson Hospital this spring quarter. Working as a physical therapist aid, Bernhardt will be attending to patients by taking their vital signs, walking them to the gym, and helping them stretch before the physical therapist arrives. After graduating in 2017 with a bachelor’s degree, Bernhardt will continue with her education to become a doctorate of physical therapy, which will take an additional three years of graduate school. “I can definitely see myself continuing with swimming after graduation. I am not ready to give it up just yet,” Bernhardt said. Bernhardt is unsure where swimming will take her; however, she is both considering taking a year off from school to focus on swimming or continuing with graduate school and swimming. With a tough mindset, Bernhardt believes she can accomplish anything and everything she makes her goal. Through her experiences as a swimmer, Bernhardt has most definitely learned these values the hard way. “I have had supportive coaches and then coaches who have said ‘Maybe you should focus on academics instead’. For me, I love swimming and I will not give it up,” Bernhardt said. With the loving support of her parents and sister, Bernhardt continues to work day in and day out in order to succeed at next week’s NCAA Swimming Championship. 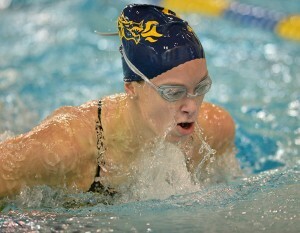 Good luck to Bernhardt, as she is the only Drexel Dragon to make it to the NCAA Swimming Championship this year.